I couldn't believe it when my doctor said I would have to have my gallbladder removed. "Can't I just change to a low fat diet?" I said groaning in pain with every typical gall bladder attack symptom. 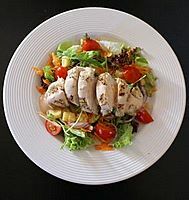 "Delicious Low Fat Recipes for healthy hot and cold chicken dishes." No, the offending organ was diseased and beyond redemption. I had just been through natural childbirth with no pain killers 12 weeks prior, so I had some idea of severe pain and this gallbladder attack was no joke. I guess my years of rich food had finally caught up on me. I have always enjoyed cheese, cream, bacon, rich sauces, extra fat on my meat and all other high fat foods. Clearly my gallbladder had had enough. Another contributing factor to the diseased gallbladder was that I had lost all my pregnancy weight - 20kg or 44lb - in four weeks and apparently excessive, sudden weight loss is not good for the gallbladder. I had my gallbladder removed and it seemed to be successful. The surgery is called a laparoscopic cholecystectomy. The doctor said I could resume my normal dietary habits and that I wouldn't have any side effects. HAHAHA - what a joke.I battled with diarrhea, gas, bloating and cramps in my intestines. In fact I generally felt unwell until I started making a concerted effert to eat more low fat foods. Every person's body is different so other people may not expereince the same discomfortas I did. There are lots more benefits to eating a fat reduced diet. You'll lose weight and look and feel better in yourself. We all know that eating a diet rich in fruits, vegetables and whole grains and low in saturated and trans fats; avoiding smoking; exercising regularly; and maintaining an appropriate weight have a powerful effect on our health. Some of the major benefits are lower levels of bad cholesterol and lower blood pressure which lessens the risk of those awful things like heart attacks, strokes and heart disease. On my quest to find information on healthyliving and losing weight, I decided to create a whole seperate website called Detox-For-Life.com It contains many informative and interesting articles on Detox and healthy living. Go have a look. It's not easy to make a major dietery change and you should always check with your doctor before you do. I have never been obese but I have been overweight for most of my life and obviously a high fat diet contributed greatly to this. Along with the fact that I love to cook and I eat for comfort too. Finding good recipes makes it an easier transition. Chicken meat is ideal for cooking uplow fat diet recipes. Just remember to take off the skin, I know, it's the best part of the chicken but the skin contains most of the fat so by removing it you will significantly lower the amount of fat in the recipe. If you leave the skin on for the cooking process, it will protect the chicken meat from drying out and add extra flavour. The chicken meat doesn't absorb any fat during the cooking process so leaving the skin on just makes it more moist.